I have been doing some exploring on Newspapers.com and have been making clippings. 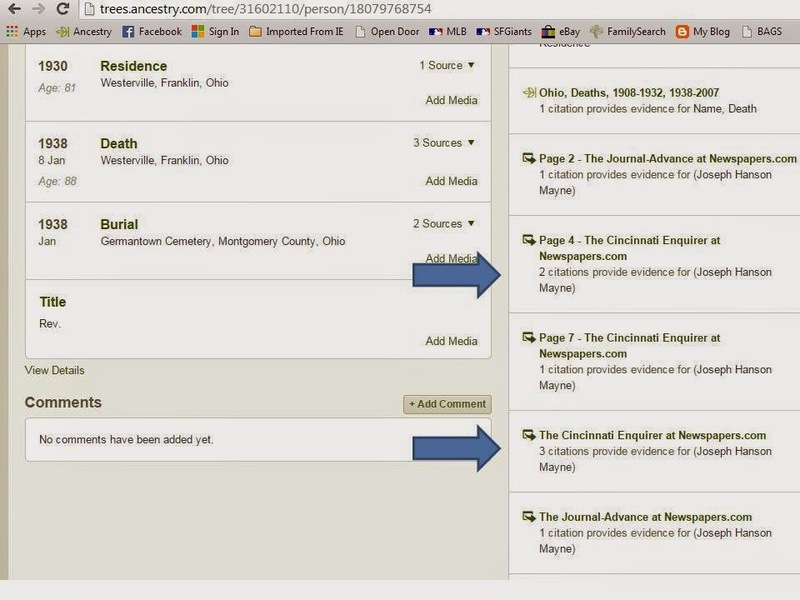 There is a function which allows the clippings to be attached to profiles at Ancestry.com. All of my clippings are also stored on my Newspaper.com account. Some of my clippings include a family reunion, marriage announcements, real estate transactions, birth announcements, and articles about club, sorority and youth group activities. These newspaper clippings are a wonderful window on the world of our ancestors. You should try it out! One of my complaints is that the collection of digitized newspapers for certain communities is incomplete. For example, my grandfather’s brother, Paul G. Mayne, and his family lived in Leavenworth, Kansas. There were several articles which mentioned his daughter, Jane in the 1950s, 1960s and 1970s. The papers where I would find his obituary in November 1962 are missing. Also missing were the papers from November 1971 where I would find his wife’s obituary. Also missing were the papers from 1954-1961 where I would have found cousin, Jane’s marriage announcement. Screen shot of clipping file at Newspapers.com. There is a typographical error: not should be now. I used the print function to save this as a PDF. Then I saved that file as a JPG and then attached the image to all of the Ancestry.com profiles for the individuals mentioned in the article. Another typo: Branford should be Banford. Newspapers are notorious for their typos. 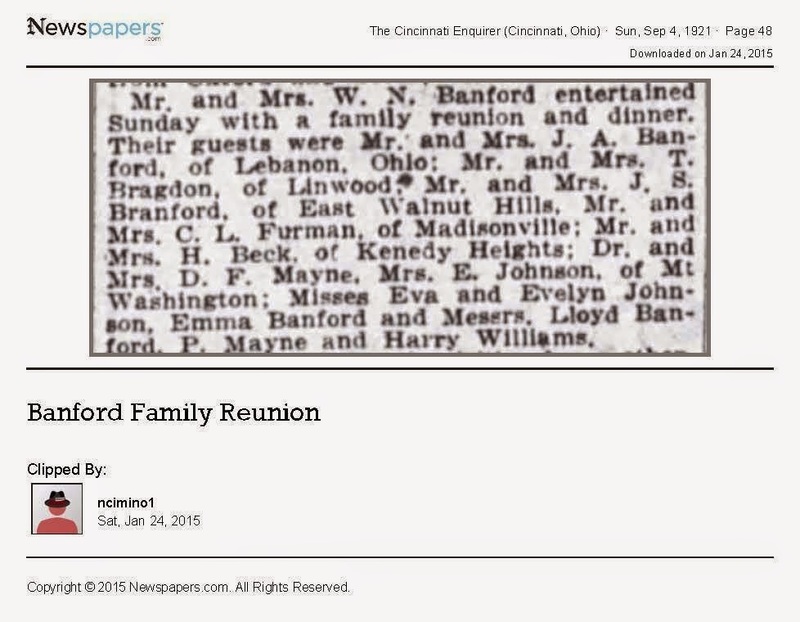 A problem that I noticed on the Ancestry.com side of the connection is that all of the clippings are lumped under one link for each newspaper at Newspapers.com. Therefore you have to have a Newspapers.com account to see the clippings. However, if you attach the entire page rather than the clipping then there is a separate link for each page number. The downside of the links for each page number is that it only gives the name of the newspaper and a page number. There is no date on the link. Furthermore, if you have two newspaper pages from different dates with the same page number there is only one link per page number. This is a screen shot from the bottom of the profile of the Rev. Joseph Hanson Mayne at Ancestry.com. The arrows show how the links to Newspapers.com show on his profile. You can either attach a clipping or an entire page. The first arrow shows a link with a page number and two citations. This is the link to an entire page but you can only access one of the citations from this link. The second arrow shows a link that will take you to the clippings that I created. See the next image to see where the link takes you. The link on Rev. 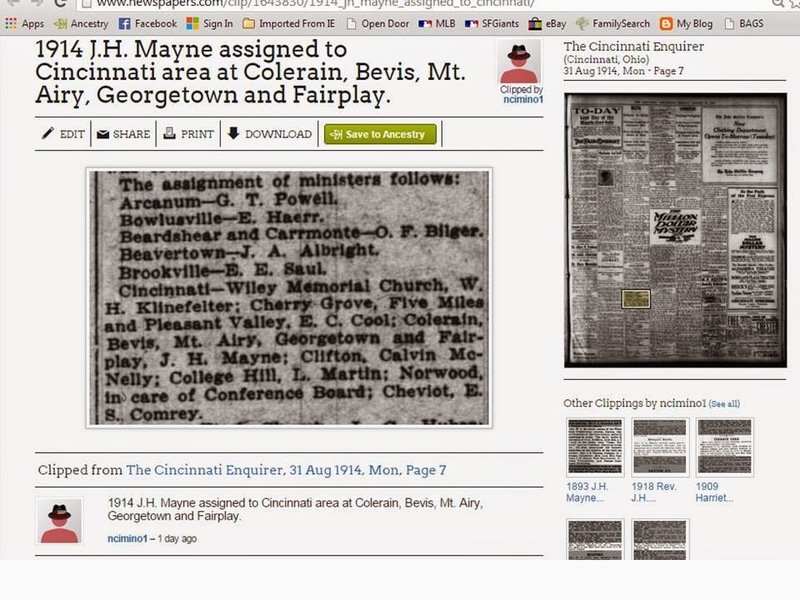 Mayne's profile at Ancestry.com takes you to this clipping that I created at Newspapers.com. Notice the thumbnails to my other clippings in the right hand column. All of my clippings are lumped together rather than grouping those that are attached to Rev. Mayne. At times, I had trouble getting the clippings to save on Newspapers.com. I made repeated attempts on several different clippings and never could get them to save. My overall evaluation of the clipping function is that it is a great way to highlight and source newspaper clippings. I like how they are displayed and the ability to add a title to the clipping. They print nicely and you can create PDF or JPG files that include the source of the clipping. However, the way they are attached to the individual profiles at Ancestry.com seems clumsy at best. It forces others that view my individual profiles to have an account on Newspapers.com to view the clippings. I recommend that you attach images of the clippings to the profile at Ancestry.com rather than use the "Save to Ancestry" button.